The five minute video, shows several dozen women in black niqabs holding AK47 rifles and shouting Allahu Akbar (God is Great) and other religious slogans. They are based at one of the oldest churches in the region, the church of Saint Simeon Stylites, which is located in the north west of Syria, in the city of Aleppo. 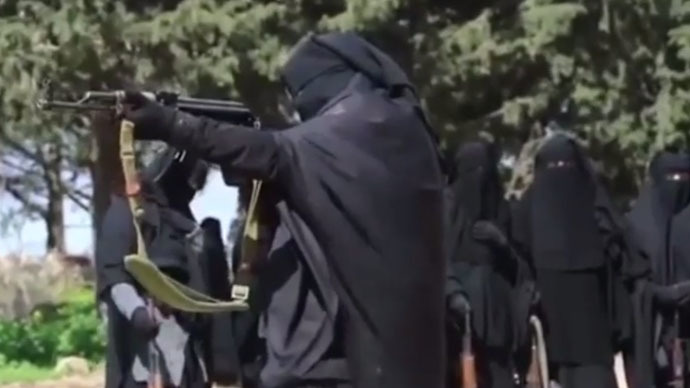 "We learnt shooting, and assembling weapons technically, and various other things," a female fighter said, who appeared in the video, which was reported by the International Business Times. "This is so we stand in one line, shoulder to shoulder, with our sons and the men in the battlefields, because the role of the woman is no less important than that of the man." Another woman revealed a plan that would see “45 sisters trained in marking and shooting” travel from Aleppo to the city of Idlib, then Daraa and then finally move on to “the center of Sham [Syria]”. The group seems to be independent of the Islamic State (formerly known as ISIS/ISIL) or the al-Qaeda-linked Nusra front. However, Charlie Winter, a researcher at the anti-extremism think-tank Quilliam says its format resembles the propaganda shown by such militant groups. The site where the women are training is not believed to be under the control of the Islamic State (IS). “They say they have come together to train and to defend their people and land. But, while ‘jihadist’ is probably the most appropriate term to describe them, they are clearly not aligned with groups such as ISIS,” Winter told the Independent. He also added that the video was probably not meant to target Western audiences. The remains of the 5th century Church of Saint Simeon, which was added to the UNESCO World Heritage list in 2011, is located at the site of the pillar of St. Simeon Stylites. He was a hermit monk who stayed on top of the 15-meter tall pillar for 37 years, preaching to pilgrims. Earlier this year, militants from an all-female group under the control of the Islamic State, the Al-Khanssaa Brigade, released guidelines for women, which was entitled “Women of the Islamic State: Manifesto and Case Study.” It encourages young girls to get married at the age of nine, while it regards a women’s role in life to stay at home, while remaining “hidden and veiled,” and “knitting and cooking”. The document does not mention any of the abuses of jihadist militants against women and children, who have been kidnapped, raped, tortured and forced to convert to Islam. A number of girls living in the West have been lured into travelling to Syria and Iraq to join IS with promises of marriage. It is feared the jihadi brides will become suicide bombers in the future.